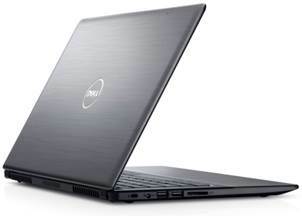 Thinnest and lightest to date, Dell launched its latest line-up of ultra-portable laptops with the 14-inch Vostro laptop – the Dell Vostro 5460. Measuring only 18.3 mm and weighing at just 1.54 kg, the ultrathin Vostro 5460 delivers more power and portability for value-conscious who’s looking for mobility and performance at the right price. Sporting an expansive 14-inch high definition widescreen LED (HD WLED) TrueLife display that supports up to 1366 x 768 pixels, the new Vostro 5460 comes with integrated stereo speakers and a dedicated subwoofer powered by HD audio with Waves MaxxAudio 4.0. Users get to enjoy 720p video content in immersive audio and visual detail. The laptop also features an integrated 720HD 1MP camera with microphones for high-definition web-conferencing. The Vostro 5460 is equipped with a full-sized Chiclet keyboard, a multi-touch gesture touchpad allowing users to fluidly navigate through the Windows 8 operating system, and a sophisticated cool-to-the-touch aluminum palm rest to ensure comfort for users. All these rich features are encased within a sleek brushed-aluminum chassis in graphite silver or fire red, and supported by a 3-cell integrated Lithium Ion battery providing up to 5 hours of battery life. Connectivity is a breeze on the Vostro 5460 with 802.11 b/g/n WiFi, Bluetooth 4.0 and RJ-45 Ethernet port. Users can enjoy and share multimedia through three USB 3.0 ports, including one with Power Share, a SD Card Reader slot, a headphone/microphone combo jack and a HDMI port. With third generation Intel Core i3 and i5 processors and integrated HD 4000 graphics at its core (or optional 2GB DDR3 NVIDIA GeForce GT630M graphics), users can opt for either the standard or Ultrabook configurations of the Vostro 5460. The 500GB HDD allows for plenty of documents and multimedia files to be stored and accessed on the go; and the 32GB SSD in the Ultrabook configuration delivers speedier performance and added storage. The Vostro 5460 comes standard with Dell’s In-Home Service after Remote Diagnosis, as well as Dell Backup and Recovery Manager for reliable and fuss-free data protection. For added security of personal data and system files, the Ultrabook configuration also comes with Intel Anti-Theft Technology and Identity Protection Technology. What I really love about Vostro 5460 is how Dell has successfully married functionality to affordability. I like a compact, slim and lightweight laptop without compromising the specifications. Another reason why I love Dell is their Customer Care. There is no need to queue when you encounter a problem, the experienced IT engineers will come knocking at your door after a simple phone call to their Technical Support for assistance. I have a 15% discount voucher, let me know if you need it. Valid till 3 June 2013. Drop me a message if you need it. This entry was posted in Annoucement, Singapore, Technology and tagged dell, dell singapore, dell vostro, laptop, lightest laptop, lightweight laptop, thinnest laptop, vostro, vostro 5460, windows 8. Bookmark the permalink.